← nothing yet . . . This entry was posted in life, New York, ny city life, nyc, Photography, thoughts and tagged benjamin franklin, east side manhattan, hurricane sandy, new york, NYC, rain storm, wind. Bookmark the permalink. Someday, I will make it to NYC. 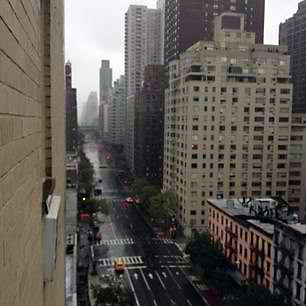 Nice pic, although I have to say, it seems weird for NY to look so dead. it’s very weird – i can’t remember the last time the city was so quiet! Stay safe!, check out my blog if you’d like. great blog! i’m following you now. hey, keep that zen attitude going! all is well and i am so grateful! Also hoping everything is OK, & awaiting your next report. thanks! all is well. very grateful.